A horrible dog attack has recently made national headlines because of the bizarre circumstances in which it unfolded. According to Fox News, Julie Stackhouse was running in the Donna Half-Marathon in Atlantic Beach when she was attacked by a dog 1 mile from the finish line. The attack happened early in February during the annual event. At Bundza & Rodriguez, we love dogs, and we realize that not all dogs are dangerous. However, we also know that many dogs are not trained or handled properly, and dangerous dogs can cause serious injuries that warrant compensation. If you’ve been attacked, you should meet with an attorney to discuss your case. The bull-terrier mix that attacked Julie Stackhouse weighed 80 pounds and was so heavy that it managed to knock her to the ground. Stackhouse claimed that she knew the dog wanted to attack her, so she shielded her face with her arms. The dog then bit her on the left arm and apparently would not let go easily. Once Stackhouse managed to free herself, she continued on and finished the race with blood running down her arm. Once across the finish line, she promptly passed out. According to Stackhouse, she was in “shock” during the altercation. The dog was not on a leash and tried to bite her face. Once she finished the race, Stackhouse went to the emergency room where she received 6 stitches. The dog was with its owner, who was a spectator at the race. The owner wrongly believed that the dog was under control even though it was not on its leash. Police have fined the dog’s owner and placed the dog in quarantine to check whether it develops rabies. According to media reports, Stackhouse is doing well. She even finished the half marathon in 4th place. Not bad for someone who had suffered a vicious dog attack. Have You Been Attacked by an Unleashed Dog? It is a little hard to believe that the owners of a bull-terrier would take their dog into public and not have it on a leash. This type of carelessness is precisely why Florida’s personal injury law allows injured victims to sue dog owners when their pets attack innocent people. Each case is different, and we can’t say ahead of time how much your injuries would be worth in a settlement. 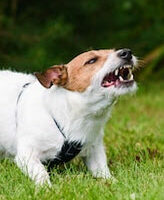 If you’ve suffered a dog attack, please contact us today. One of our Daytona Beach dog bite lawyers at Bundza & Rodriguez, P.A. will meet with you for a free consultation to answer any questions you have, so please call 386-252-5170. There is no reason to delay.